As I write this, the smell of raspberry swirl cake is wafting through the room, filling the house with a scent that is sweet, fruity, vanilla, and just plain heavenly. It’s everything you want to smell coming from your oven, and the anticipation is building. You see, yesterday I received a copy of Love, Laugh, Bake by Silvia Colloca, and today, a lazy Saturday morning, is the day I finally get to turn on the oven and try out my first recipe. It wasn’t easy to choose. Love Laugh Bake is one of the densest cookbooks I’ve ever come across. The theme is baking, and the book is filled with recipes and information on bread (rye, sourdough, no-knead, flat breads and gluten-free), as well as cookies, pies, pastry, cakes, tarts and more. There are over 120 dough-based recipes in the book, which Silvia says she had a lot of fun putting together. 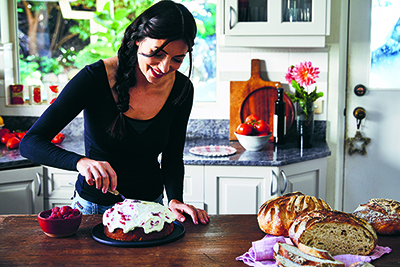 ‘I was pregnant when I wrote it, and all I wanted to do was cook and eat cake,’ she laughs. It’s fitting then that the book be such a deeply genuine family experience, featuring photographs of Silvia herself in her own kitchen, her husband (Richard Roxburgh of ABC’s Rake), and their baby Luna. All are shown sampling treats fresh from the oven. Real representations of a real family eating real, home-cooked food. Silvia Colloca is known in Australia mostly for her television presence. "Made in Italy with Silvia Colloca’ was a 10-part TV series premiering on SBS in 2014. It was filmed in Italy, and featured her family and her mother’s kitchen in Abruzzo. Two years later, the ABC brought us ‘Silvia's Italian Table.’ In this 8-part series, Silvia plays host to notable Australian personalities, creating a hybrid of the reality show and the cooking show formulae. It gave Silvia the opportunity to dine with Australian celebrities. In a country where food and cooking shows are certainly in no shortage, one could ask what is so special about Silvia Colloca. Where does this Italian woman, a relative newcomer, fit into the picture? We discuss briefly the scrutiny Colloca faced when commentators mistakenly identified the luxurious set of Silvia’s Italian Table as her and Roxburgh’s own home. The network chose the space because of its beauty and the large space for film equipment, but filming there was ‘a mistake’, she acknowledges. Silvia has grown up cooking, and she is clearly comfortable in the kitchen, as well as in front of the camera. It certainly could be this realness that appeals to Australian audiences. Well, that, and the mouth-watering recipes. Speaking of which, my raspberry cake is ready now, and it tastes even better than it smells. I flick through my copy of Love, Laugh, Bake. It’s still new, but it will be speckled with dried dough and batter in no time, I’m sure of it.